Portland Retro Gaming Expo (PRGE) is on next week from October 20-22. Exhibitors, panels, guests, a massive arcade, tournaments, and cosplay dominate this convention, which is obviously a huge love letter to retro gaming. AtariAge, one of the biggest online retro website forums and producers/retailers of homebrew software and other retro gaming goodies is exhibiting at PRGE and will be launching a slew of new homebrew games. 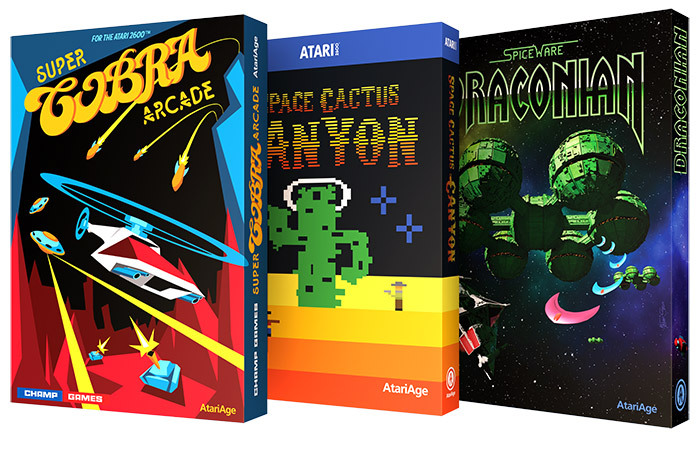 Super Cobra Arcade, Space Cactus Canyon, and Draconian, all for the Atari 2600, will be launched in November. Super Cobra Arcade is a sequel to the classic arcade game Scramble. In Space Cactus Canyon the player is, you guessed it, a cactus trying to collect the Earth’s remaining water and escape to Mars…bizarre! Draconian is a frantic arcade shooter with 48 sectors for the player to survive and destroy. Discussion of these titles can be found on the AtariAge forums. In addition, a number of other games will be released. AstroStorm is the first fully-featured and team-tested game written in Reboot’s RAPTOR Basic +, an easy to use and free development environment for the Atari Jaguar (Rb+ is available on GitHub). Escape 2042 for the Jaguar is an platform game set in three environments where avoiding cameras, collecting grenades, and hacking computers are just some of the tasks you’ll need to complete. In addition, there are two mini games included (rappelling and a ‘reverse’ shoot-em-up). Also for the Atari Jaguar is the release of Jeff Minter Classics, including the games Llamatron and Revenge of the Mutant Camels on a single cartridge. Included in the package is a double sided poster of the box art by William Thorup. These officially licensed 16-bit (Atari ST and Amiga) Llamasoft ports hold a fond place for me for a couple of reasons. The first and most obvious reason is that I played the hell out of both games (especially Llamatron) on the Atari ST throughout the 1990s, no doubt much to the detriment of my university assignments. I always felt guilty about not paying the shareware fee; I wonder how many others ‘forgot’ to do so too and will purchase this physical copy of the titles as recompense. The second reason is less obvious; about six months ago I was asked to create a short tune of title screen music for this upcoming release. Home sick with a cold and bad back, in a couple of hours I managed knock out a fittingly 90s style rave tune replete with dozens of Llamsoft game titles (zaps, bleeps, and sheep bleating of course). You can hear the tune on the video ad for the game below (do check out the Retrospekt shout out at the very end of the clip). Expect a full length release of this truncated one minute tune in the not too distant future. 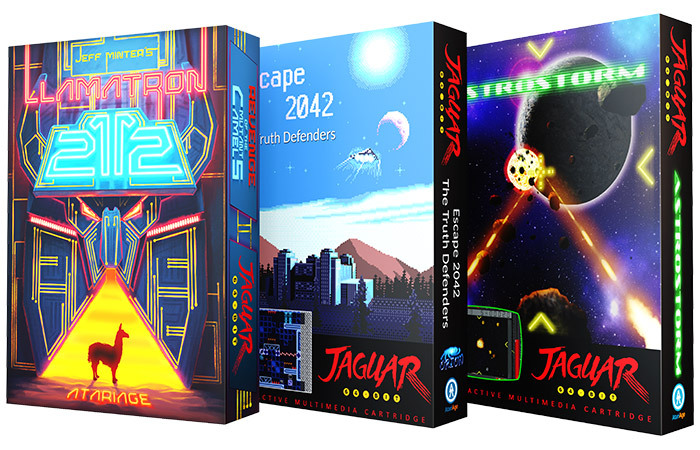 Discussion of these Jaguar titles can also be found on the AtariAge Jaguar forums. AtariAge are strong supporters of the retro scene and have released dozens of hombrews over the years, many with both PAL and NTSC options. Check them out to see if there’s anything that piques your interest. We’ll be watching closely as events unfold at PRGE 2017 and will be sure to report on any emerging retro gaming news that comes out of this important retro gaming event.